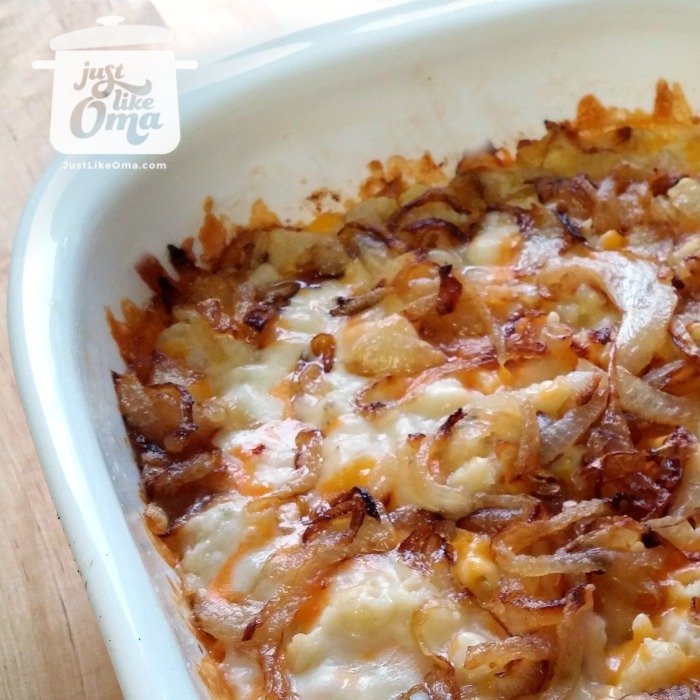 Cheese Spätzle covered with Caramelized Onions make a wonderful meal, all by itself or served as a side that fits to almost anything! 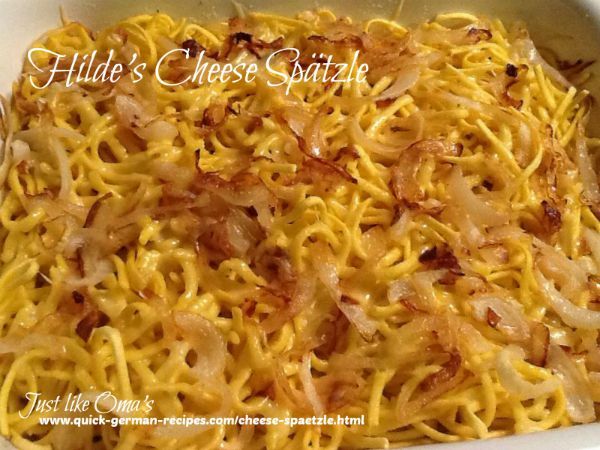 Cheese Spätzle is a traditional German way of serving this favorite German noodle. Using either the homemade recipe or store-bought noodles, the resulting dinner is delicious. 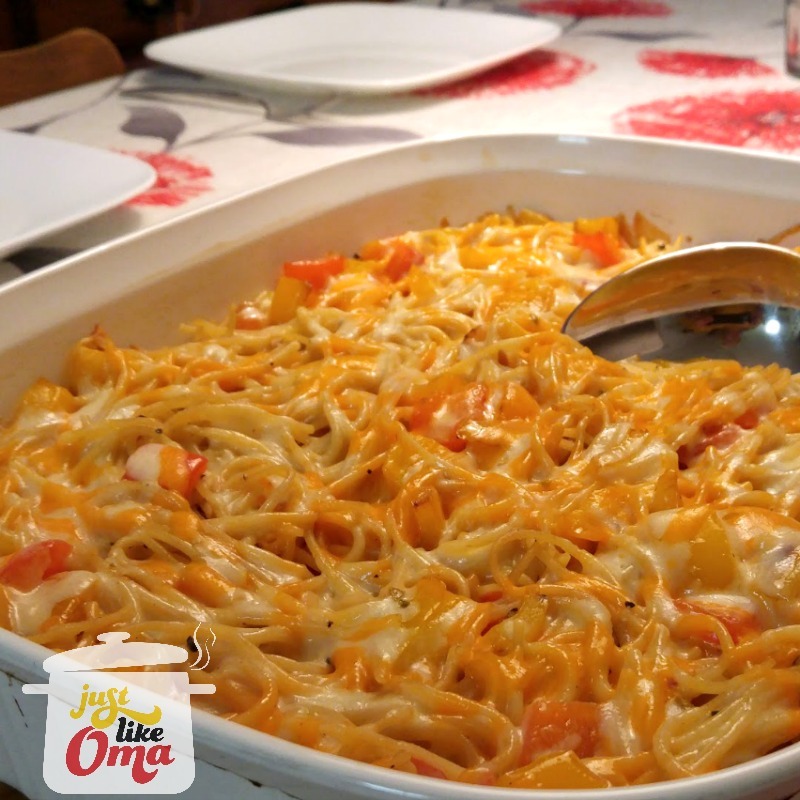 Follow my recipe below to serve them in a delicious cheese spätzle casserole. It's German "Mac & Cheese" only better! Really. 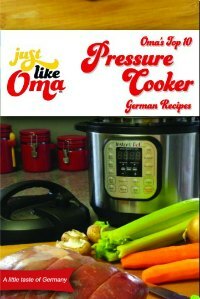 It really is a quick German recipe when you use packaged noodles, or you can start from scratch, making them, just like Oma! Yes, I love my Spätzle lid with the scraper to make these noodles. Enjoy! So easy to make these and they taste so much better than the packaged kind. 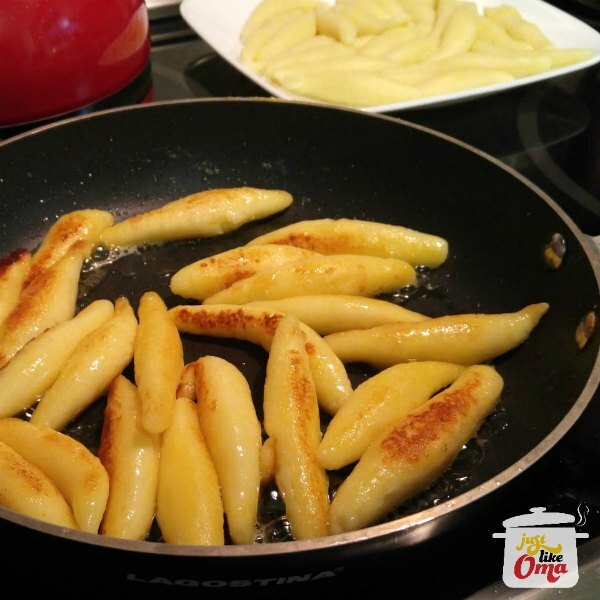 Heat butter (or oil) in skillet and sauté onions until tender and lightly browned, about 5 - 10 minutes. Butter casserole dish. 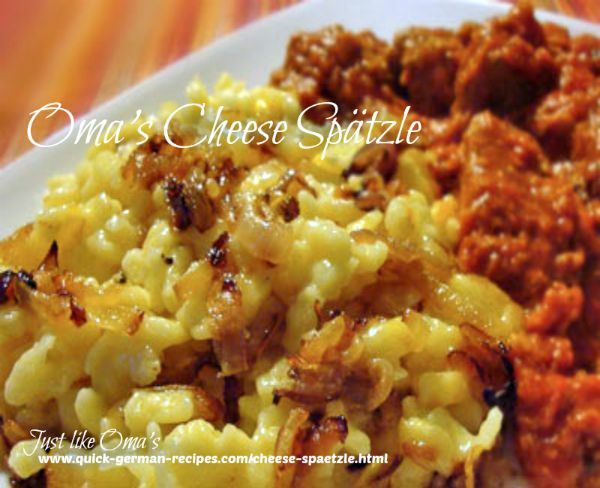 Begin by layering with ½ of the Spätzle, season with salt and pepper, sprinkle with ½ of the cheese. Repeat, ending with the cheese. Top with the sautéed onions. Bake, uncovered, about 20 - 30 minutes, or until bubbly and slightly browned on top. 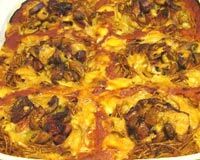 Try this with Cheddar or Jarlsberg cheeses or a combination of the two. 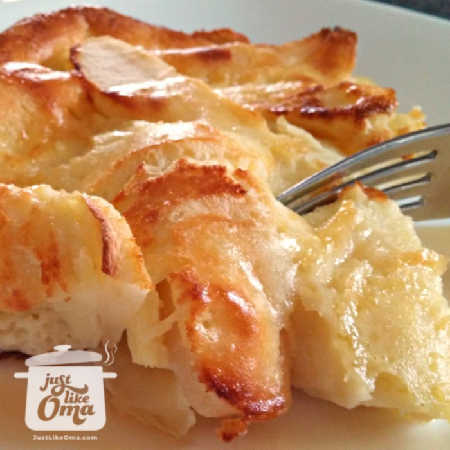 When the noodles are button-shaped, they are called by their Swiss name, Knöpfle, which means "small buttons"
Check out Oma's homemade German Spätzle recipe if you want to learn her way of how to make noodles. 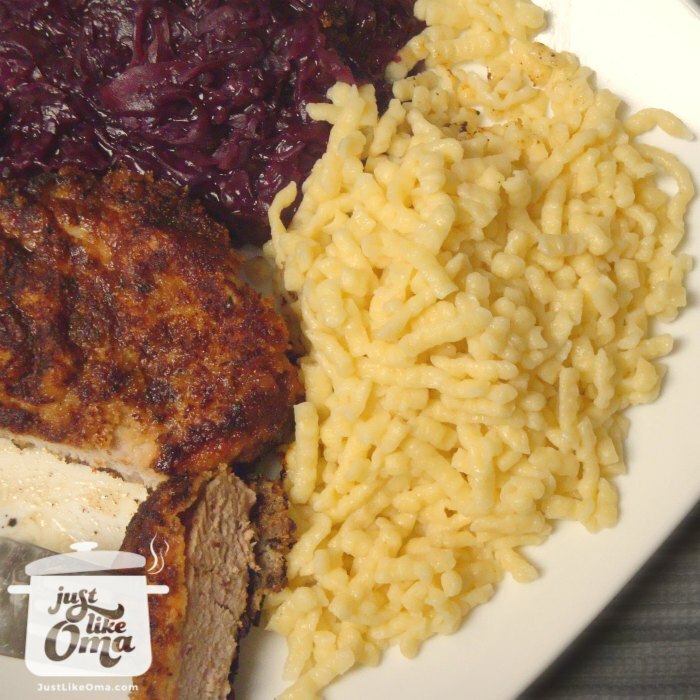 Try the easy recipe and delight your family with this is a very traditional German noodle dish. Here, the noodles are covered with caramelized onions and served with a ground beef sauce. 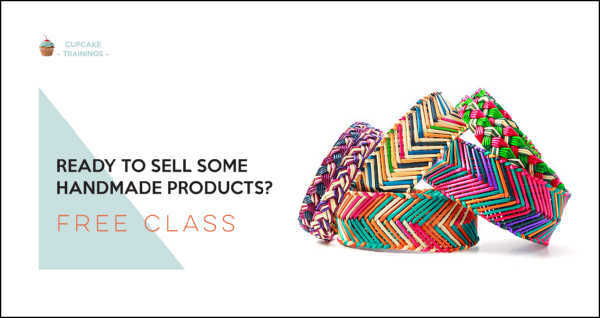 Perhaps you found a package of dried noodles and are wondering what to do with them? You can just cook them and serve them with caramelized onions on top. Delicious. 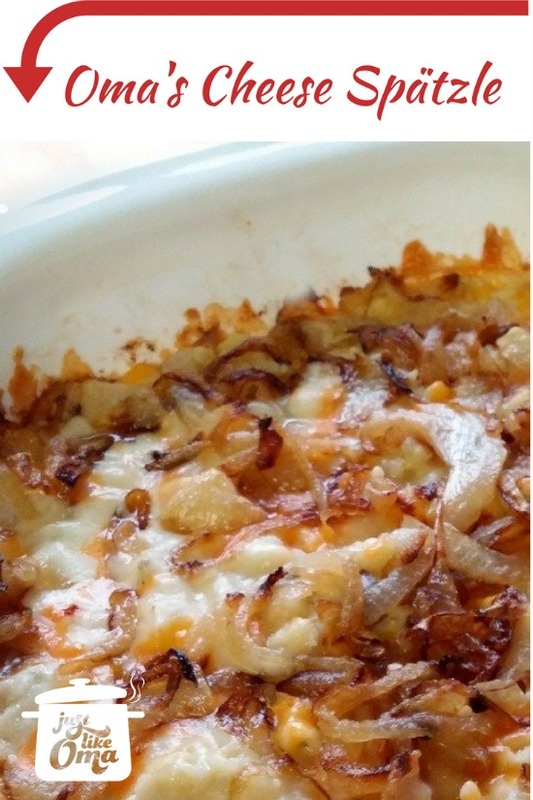 Or, turn them into this cheesy casserole and have your family wanting seconds. Here, I made the Spätzle dough thicker than normal, resulting in a different 'look' aka Knöpfle (in Switzerland). 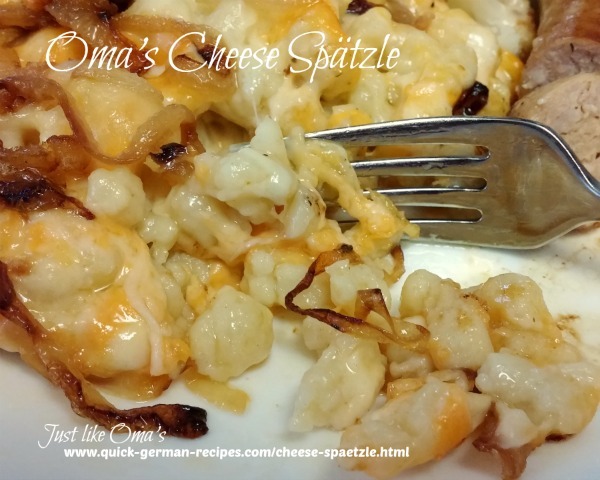 Delicious when turned into a Cheesy Spätzle Casserole! Not Italian ... It's German! I used to think that whenever Mutti made a noodle dish that we were eating "Italian-style". 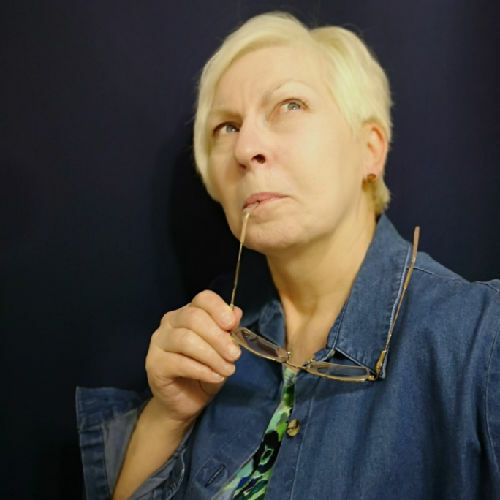 It was only when I started this website and started searching German recipes and origins, that I realized that noodles are VERY German. This is especially true of southern Germany. 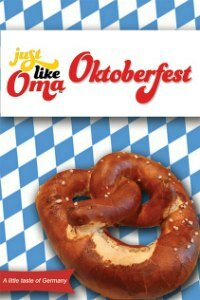 Because my Mutti and Papa came from the Berlin area, this was not part of our culture. 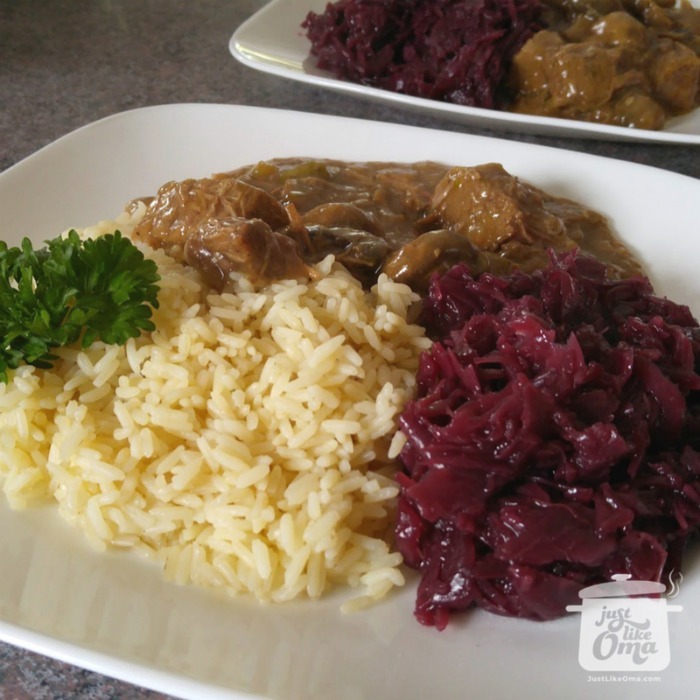 Look at this deliciousness that Hilde Lumm, one of our German Foodie Fans, made. WUNDERBAR! 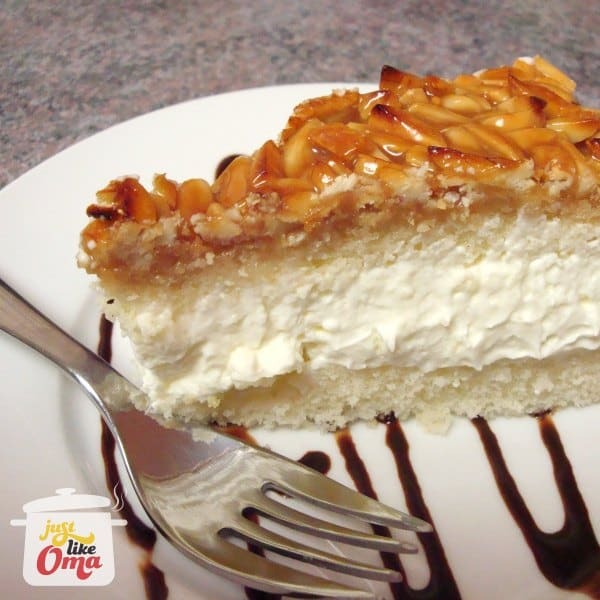 Covering the top of the Cheese Spätzle with caramelized onions is the icing on the cake. Not what I would have considered myself, but seeing that is how they serve it in Germany, I had to give it a try. A meat sauce on the side. Perhaps a green salad as well. Nothing else needed. Pressure Cooked Rice - PERFECT! Make every day a TRANSFORMING day! "And the Lord -- who is the Spirit -- makes us more and more like Him as we are changed into His glorious image." Cheese Spätzle is a traditional German noodle dish. A sort of Germanized version of 'Mac & Cheese', only better! 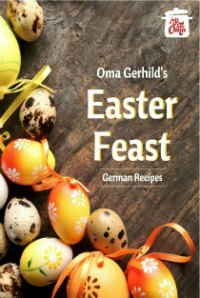 Gerhild’s Just Like Oma website has always been a go-to when I’m searching for German recipes that taste like home, so I’m absolutely delighted that her fabulous recipes have been captured in book form. 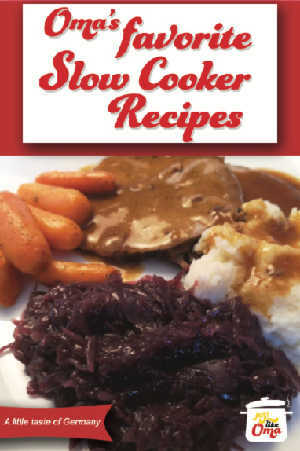 This beautiful cookbook is loaded with regional recipes and mouthwatering photographs. These delicious soups are truly made in no time at all, quick, as the title says, with ingredients that you most likely have on hand. What a relief it is not having to go shop for ingredients you don’t know how to pronounce! 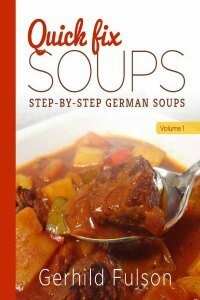 Included in the book are many ideas of substituting the original ingredients and turning-up the taste a notch or totally changing the taste of the soup. The directions are easy to follow and easy to understand. You’ll have no problem serving these soups to your guests. 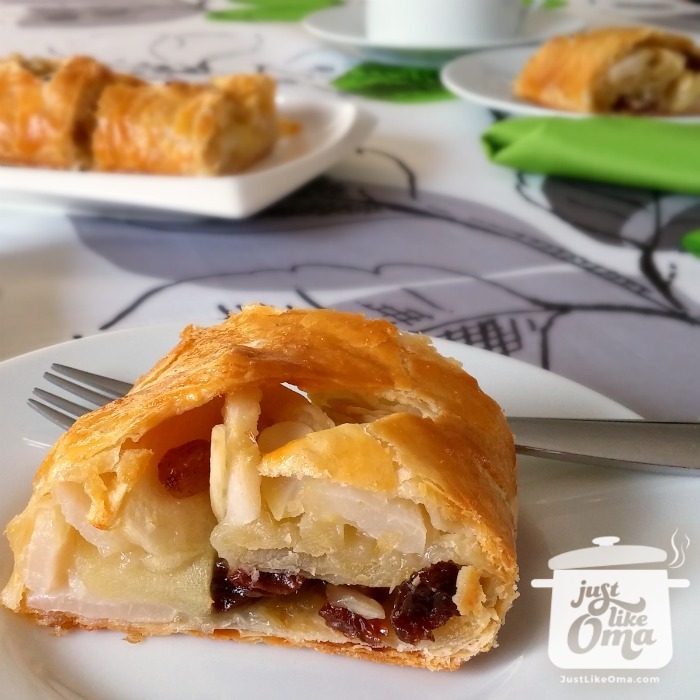 They are foolproof & yummy delicious! What I love the most is that you add a little bit of this and a little bit of that. You don’t have to be exact at all with measuring the ingredients. And cutting up the vegetables doesn’t have to be pretty either. 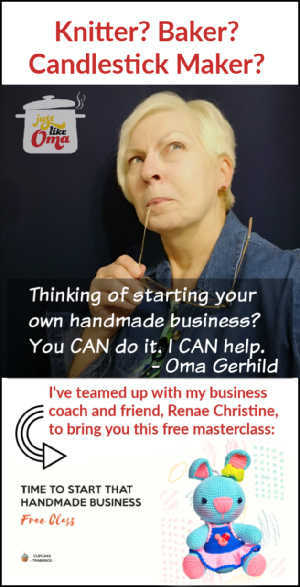 Gerhild makes it so easy! She takes away the fear of messing up or trying something new. 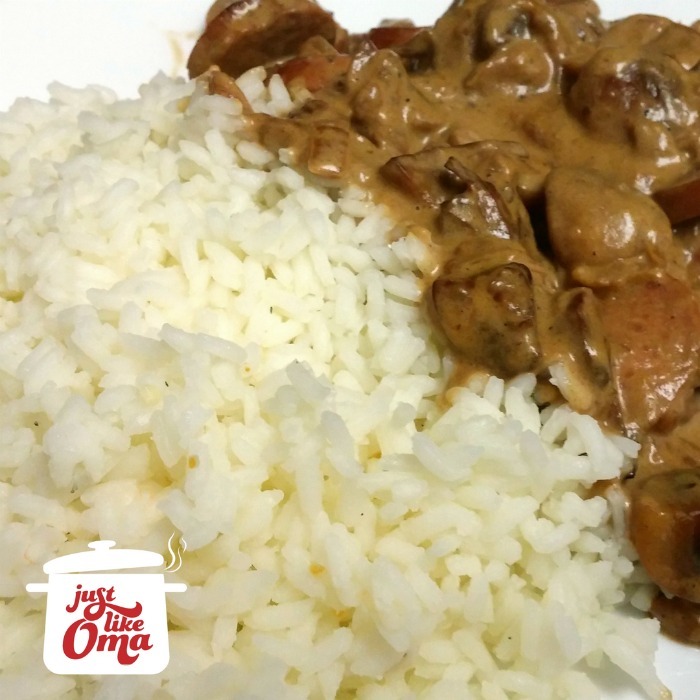 Quick Fix Soups is a great addition to my recipe collection, one I don’t want to miss. 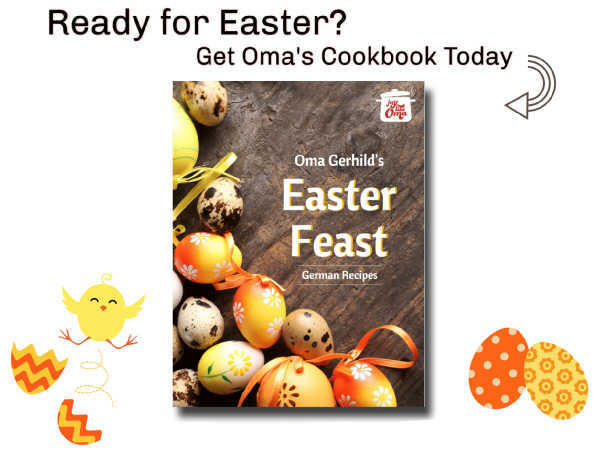 Thank you, Gerhild, for inspiring us all and saving us time in the kitchen! 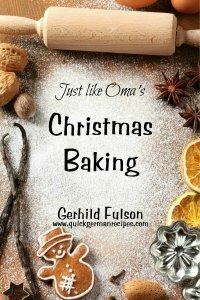 I have followed Gerhild’s recipes for many years. 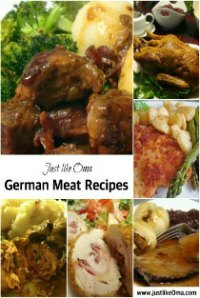 Her recipes are similar to the ones I grew up eating from my German heritage. 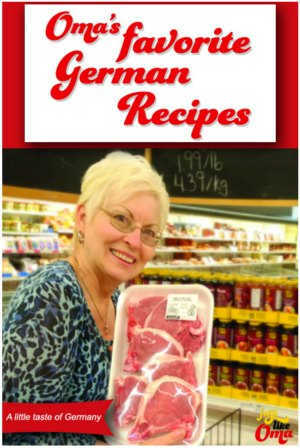 I have found her recipes to be authentic and easy to understand. 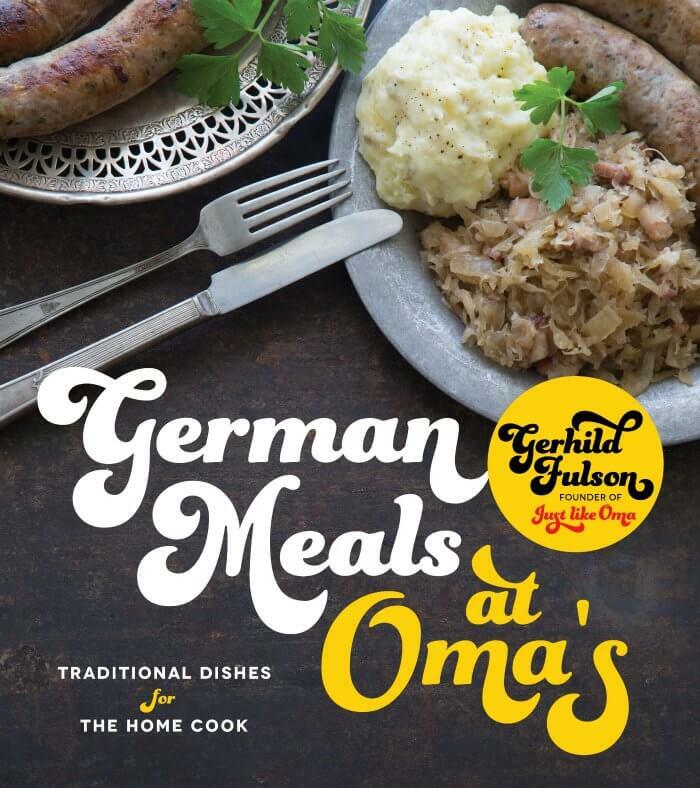 In Gerhild’s book, German Meals at Oma’s, I like how she divided the recipes by regions of Germany. 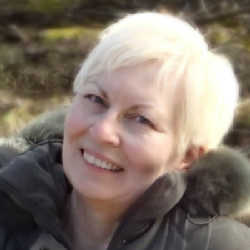 I also love her pictures and little tips given about the recipes. These are great for the readers! 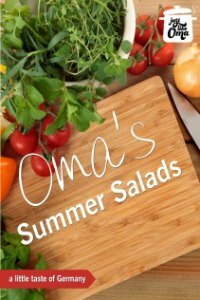 I recommend this book for all cooks; beginners and experienced.